The tundra has come alive, lush and green for our brief arctic summer. You can see snow tucked in pockets in the hills and high on the mountains, but at lower elevations the ground will be free of ice and snow, at least for a while. This month, many of our village listeners are living in wilderness camps, gathering food for the winter. These spots take many forms. Some have small cabins. More often than not, shelter is a canvas tent stretched over wooden poles. One thing you’ll always find is a radio, and it’s a safe bet that it’s tuned to KNOM throughout the long Alaska summer day. Thank you for providing this important service to these most isolated people. God bless you for it! Special note: To celebrate our mission's 35th birthday, this month's Nome Static has been expanded. There's so much happening! REMEMBERING: (left) Inupiat (in-OO-pee-at) Eskimo elder Dan Karmun, Sr. prays the benediction at Nome’s Memorial Day ceremony. Beside him, KNOM news director Paul Korchin (in sunglasses) uses a portable transmitter to beam the observance to the studio, and live over the air. KNOM has broadcast the ceremony, a solemn procession to Nome’s cemetery and back, for the past thirty years. Dan has appeared over KNOM many times. He was the first subject of the station’s now monthly “Elder Voices,” a program which encourages seniors to share their wisdom, as well as relate experiences from the old days. CITIFIED: It’s only the 151’s largest city in the United States, but Anchorage is 77 times larger than Nome. In the “big” town recently was KNOM program director Kelly Brabec. The event was the state’s Special Olympics. For three years, Kelly has been volunteer coach for Nome’s one Special Olympian, a young woman with Down Syndrome. Yay, Kelly! KNOM is the oldest Catholic radio station in the United States, beaming inspiration, education and positive entertainment across 100,000 square miles of western Alaska since 1971 — thanks to you. INSPIRATIONAL SPOT: God has created me to do Him some definite service. He has committed some work to me which He has not committed to another. I have a mission. A STAR IS RE-BORN: (left) Rigger Josh Morris returns a repaired KNOM Christmas Star to the top of the 80-foot studio tower. Josh re-painted the 230-foot KNOM-AM tower, and he and dad Bill plumbed and performed other maintenance. The star was damaged in a windstorm last October, and repaired by visiting former chief engineer Les Brown. In August, we'll feature a picture or two of tower maintenance and painting. SPOTTED: As with our inspiration, a large component of KNOM’s educational programming is in the form of short spots, anywhere from ten seconds to two minutes in length, sprinkled among music and news. Thank you for helping to make our work possible! MILESTONES: Calculating exact numbers regarding KNOM’s history is impossible. Going back 35 years, there are no records of all outages, or times off the air for routine maintenance. For its first three years, KNOM broadcast 16 hours a day. For the next twenty-two, we were on the air for 18 hours, with occasional all-night broadcasts during severe storms and other events. During some summers, we extended that to 20 hours. We were off the air several times. Since January 9, 1996, we’ve broadcast 24 hours a day, with a few outages due to lightning damage and planned maintenance, such as tower painting. 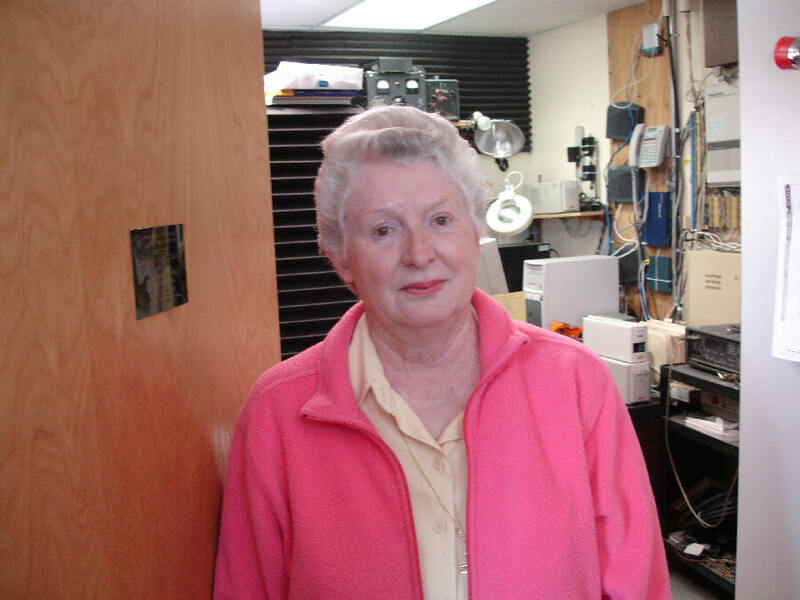 � KNOM’s quarter-millionth hour on the air occurred approximately June 19th. � KNOM’s one-millionth inspirational spot, and one-millionth educational spot, will be broadcast approximately October 18th. � As of July 14, 2006, KNOM’s 35th birthday, the station has aired the Holy Sacrifice of the Mass approximately 2,300 times, and the Rosary about 7,100 times. Aren’t these incredible numbers? We sincerely thank everyone who has sacrificed and contributed to and prayed for this mission. Thank you! INSPIRATIONAL SPOT: If loving every one of your neighbors was easy – it wouldn’t be a commandment. SEND-OFF: Recently, KNOM public affairs director Amy Flaherty spent four days in the Bering Sea village of Scammon Bay, home to 509 souls, 185 miles south of Nome. The occasion? A fiddling festival, celebrating the departure of seven village National Guardsmen, who were assigned to posts in Iraq. (Left) Five of the deployed soldiers, who are part of the 297th Infantry, 2nd Scout Battalion. As children, the Guardsmen had plenty of snow for snowballs, and at an early age, learned how to hunt in order to put food on the family’s dinner table. As a result, they are experts at throwing grenades and at shooting. They will leave in July and train in Mississippi to help acclimatize them to the brutal Middle East heat. Two nights, there were dances for teens, to give the young ones a positive activity. (Left) Amy poses with three fiddlers from the KNOM-friendly village of Stebbins. From left: Joe Washington, Amy, Francis Pete and Hilary (pronounced "heh-LARRY") Snowball. (Left) The Yup’ik Eskimo village of Scammon Bay in the heart of KNOM listening country. According to Amy, the wives of the soldiers raised all of the money to hold the festival, including chartering of planes. They held game nights, basketball tournaments and cake walks. (Left) Behind Scammon Bay sits one of the hillside rock formations that kids use as playgrounds, despite spooky stories associated with them. The solders expressed sincere gratitude for the festival. “They said ‘we hope we have as nice a homecoming as we did a send-off,’” Amy quotes. (Left) “Elder Voices” subject Felix Walker, Sr. is a former Scammon Bay mayor who eradicated bingo and pull tabs in the village. INSPIRATIONAL SPOT: God never asks about our ability, only about our availability. Three of Lorraine’s children, Lynette, Damien, and Bro. Normand Berger, FIC, volunteered for KNOM as young adults in the 1970s and 1980s. Remarkably, between 1982 and 1984, the three siblings served the mission simultaneously. The dark plaque on the door honors Bro. Normand, who was KNOM’s chief engineer between 1976 and 1985. He died in the crash of a missionary plane in Zaire in 1989. THAT’S THE WAY IT FLOES: By June 1st, pack ice had broken up on the open ocean, leaving the sea dotted with little pans and bergs. For the shore-fast ice at Nome, it was another story. High winds during winter had crumpled it in places, creating gigantic, heavy pressure ridges, firmly anchoring it to the sea floor from the beach to about a half-mile out until the third week of June. Still, for most of the month, a large chunk of ice held fast to Nome's jetty. SNOW BUSINESS: June 5th and 6th brought snow showers to Nome. That’s not unusual. We remember a mid-June day about twenty years ago with an accumulation of seven inches. According to old-timers, the Memorial Day parade was canceled in 1947 due to new four-foot drifts. ORIENTAL: We thought it was pretty cool when volunteer production director Eric Gauthier answered the phone, and it was long distance from Tokyo, Japan, someone asking us to send a birthday greeting to a listener in the village of Gambell. Then we checked, and discovered that Nome is only 2,997 miles from Tokyo. It’s closer to us than Moose Factory, Ontario! Please consider adding KNOM to your will. For most of us, a bequest is the largest gift we are ever able to make. We prayerfully place all such gifts into funds that provide for major improvements and protect the mission during future emergencies. INSPIRATIONAL SPOT: It is my joy in life to find at every turning of the road the strong arm of a comrade, kind, to help me onward with my load, and since I have no gold to give, ‘tis love alone must make amends. My only prayer is while I live, God make me worthy of my friends. THIRTY-FIVE YEARS AGO: (left) At 4:20 PM on July 14, 1971, Bishop Robert Whelan, SJ, offered a prayer in Studio A. At 4:30, volunteer John Pfeifer began a half-hour taped countdown. 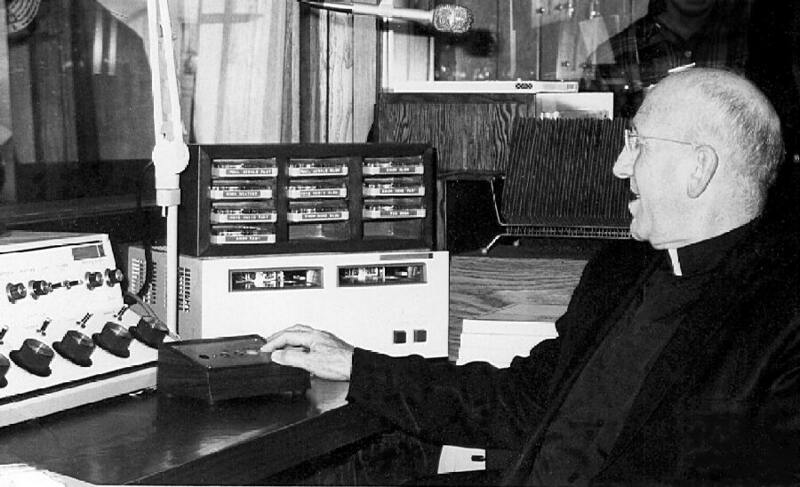 And at 5:00, Bishop Whelan pressed the Scully tape recorder PLAY button that started KNOM’s first program. For its first four years on the air, KNOM's staff was composed entirely of full time unpaid volunteers. The initial crew included news director Harry Gallagher, announcers Alex Hills, John Pfeifer and Leo Kehs, plus announcer/engineer Tom Busch. Happy birthday, KNOM! And we offer special prayers for the nearly 400 individuals who have volunteered since that very first day. FORTY YEARS AGO: We missed last month’s personal anniversary, and, in fact, so did financial officer/ past long-time general manager Tom Busch. It was the first week of June, 1966 that Tom landed his first paying job as a professional broadcaster, between his freshman and sophomore years at Boston College. The station was WLDB in Atlantic City, New Jersey, owned by Leroy Bremmer. In his late 70s, Bremmer was an engineer who had studied under Marconi and had been a personal friend of “Father of Radio” Lee DeForest. In 1926 he had helped set up the original NBC Radio Network and was the founding chief engineer of the defunct DuMont Network, which inaugurated, among others, Bishop Fulton Sheen’s television career in 1952. “I was in awe,” Tom remembers. THIRTY YEARS AGO: KNOM’s annual $20,000 order of canned and dried food, cereals, sugar and flour and paper goods missed the first oceangoing barge from Seattle and arrived a month late, in July 1976. Despite lean times, the Nome Static reported that among the staff of twenty, “nobody lost weight.” That was possibly due to the fact that most of the items which remained from the previous year were pasta, flour, corn meal and canned fruit. UN-TANGLED WEB: This web site, www.knom.org, is simple and unpretentious. But you’ll find lots of information on our work, including hundreds of photographs and the most recent 112 Nome Static newsletters. We invite you to join us! OUR PLEDGE TO YOU: We respect you and your privacy. We continue to promise, as we have since our very first days, that we will never provide your name and address to anyone for any reason. OUR SINCEREST THANKS: As our mission embarks on its 36th year of broadcasting, we thank you once more for your kindness. Thanks to you, we continue to bring God’s Word, the Mass, the Rosary and continual inspiration and education to people in this far-flung region. We are working hard to eliminate its serious problems, the highest U.S. rate of alcoholism, suicide, child sexual abuse and domestic violence, among others. By helping the KNOM mission, you are doing a very good thing. May Our Heavenly Father bless you abundantly for your generous gifts and your prayers.